The first Sunday of Lent celebrates icons, an integral part of the Orthodox faith. The first Sunday of Great Lent is called the Sunday of Orthodoxy or the Triumph of Orthodoxy. For Orthodox Christians, this day celebrates the end of the “iconoclast” controversy, in which those who believed that images of Jesus and the saints could be used in worship and those who believed that these images were akin to idolatry. Those who are familiar with Orthodox worship will know which side won out. The veneration of icons, or images of Jesus and the saints, is an integral part of Orthodox faith. Orthodoxy teaches that humans were the first icons – made in God’s image. Icons themselves are an extension of this belief. Venerating an icon is not worshiping an idol, but rather showing reverence towards the person depicted in the image. There is no particular tie between the Triumph of Orthodoxy and Lent. It just happens that this feast falls during the season. Likewise, there is no particular tie between this little history lesson and this recipe. As it’s Sunday, I decided to offer a slightly more elaborate dish. Also, as it’s Sunday, it’s possible to cook with oil. While it’s possible to make this dish without oil, I think it would lose some of its flavor. Heat a large skillet over medium heat. Add ¼ cup oil. When oil is hot, add approximately 4 Tbsp of garlic slices. Saute until golden. Add tomatoes. Let tomatoes warm, then crush with a wooden spoon. Add 1 cup of water, salt and red pepper flakes to taste, and oregano. Simmer 10-15 minutes until sauce thickens. 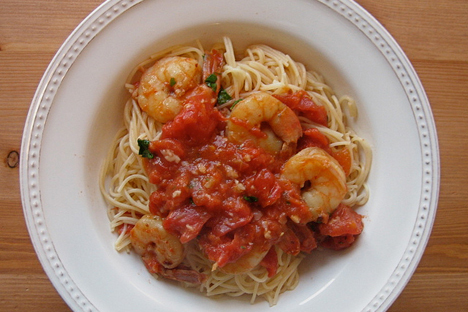 To cook shrimp, heat 4 Tbsp oil in a large skillet over medium heat. Add approximately 2 tbsp garlic clove slices and sauté until they are golden. Add shrimp. Saute about 5 minutes. Remove from pan. Add to sauce along with basil and simmer a few minutes. Serve over pasta.